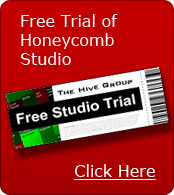 Richardson, Texas (April 3, 2013) – The Hive Group, the world’s leading provider of treemap interfaces, today announces the release of Honeycomb Studio 5.10. Honeycomb Studio advances data discovery to a new level, offering a flexible managed environment for administering large-scale deployments of treemap applications. The latest release introduces major new options for accessing data, accommodates diverse user populations and needs, and tailors new design flows around the creation and management of the data objects that underlie Honeycomb applications. Honeycomb Studio 5.10 also means that data discovery capabilities can be deployed with confidence. Studio upholds basic philosophies around building and sharing treemaps, among them: a “create once” principle, support for “live treemaps” of live data, auto-customization of views for each user, and sharing and publishing functionality that respects each user’s security. Honeycomb Studio 5.10 delivers much more power than a simple dashboard application. Since Studio exists as an entire managed environment, it is aware of each user’s security profile, delivering only those views that are appropriate to each user, and populating those views only with data that is relevant to each user. Honeycomb treemap applications may be distributed to audiences of hundreds or thousands; and the treemaps will automatically customize themselves to each end user’s security. There’s no burden on the designer to re-create customized applications. And again, that designer might belong to a centralized IT group, or may be an operational end-user. David Dewitt first used Honeycomb while serving as Marine Expeditionary Force Communications Maintenance Chief in the United States Marine Corps. Certified in Continuous Process Improvement and specializing in Six Sigma, David is now employed by L-3 Communications managing their data analysis challenges. “For The Hive Group, it’s not just about data discovery...it’s data discovery elevated, and placed into operational contexts,” remarked David. The Hive Group specializes in data discovery and visual analytics, developing advanced treemap interfaces for operational and financial analysis. Customers include major manufacturers, financial services organizations, logistics companies, natural resources companies, military branches, and many government agencies. The company’s interfaces are used to analyze performance, manage assets, identify anomalies and trends, assess risk and compliance issues, and more. The company’s patented Honeycomb® software has been commercially available for over twelve years; and is its flagship offering. Sample Honeycomb applications are found at www.hivegroup.com/gallery/. The Hive Group also offers HiveOnDemand, the world’s first cloud offering dedicated exclusively to treemapping. HiveOnDemand is found at www.hiveondemand.com.